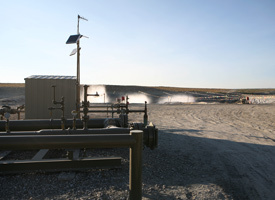 Sublette County is the home of one of the nation's largest natural gas fields, and many of its 6,000 wells have undergone a process pioneered by Halliburton called hydraulic fracturing, which shoots vast amounts of water, sand and chemicals several miles underground to break apart rock and release the gas. The process has been considered safe since a 2004 study (PDF) by the Environmental Protection Agency found that it posed no risk to drinking water. After that study, Congress even exempted hydraulic fracturing from the Safe Drinking Water Act. 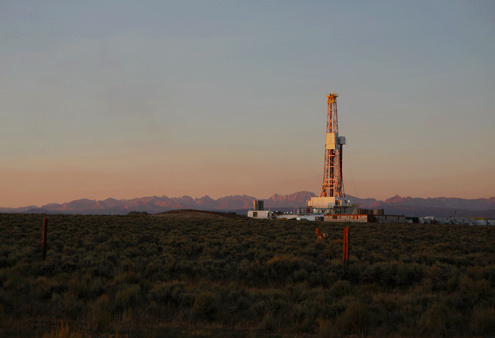 Today fracturing is used in nine out of 10 natural gas wells in the United States. Over the last few years, however, a series of contamination incidents have raised questions about that EPA study and ignited a debate over whether the chemicals used in hydraulic fracturing may threaten the nation's increasingly precious drinking water supply. An investigation by ProPublica, which visited Sublette County and six other contamination sites, found that water contamination in drilling areas around the country is far more prevalent than the EPA asserts. Our investigation also found that the 2004 EPA study was not as conclusive as it claimed to be. A close review shows that the body of the study contains damaging information that wasn't mentioned in the conclusion. In fact, the study foreshadowed many of the problems now being reported across the country. It is difficult to pinpoint the exact cause of each contamination, or measure its spread across the environment accurately, because the precise nature and concentrations of the chemicals used by industry are considered trade secrets. Not even the EPA knows exactly what's in the drilling fluids. And that, EPA scientists say, makes it impossible to vouch for the safety of the drilling process or precisely track its effects. "I am looking more and more at water quality issues…because of a growing concern," said Joyel Dhieux, a drilling field inspector who handles environmental review at the EPA’s regional offices in Denver. “But if you don't know what's in it I don't think it’s possible." Of the 300-odd compounds that private researchers and the Bureau of Land Management suspect are being used, 65 are listed as hazardous by the federal government. Many of the rest are unstudied and unregulated, leaving a gaping hole in the nation's scientific understanding of how widespread drilling might affect water resources. Industry representatives maintain that the drilling fluids are mostly made up of non-toxic, even edible substances, and that when chemicals are used, they are just a tiny fraction of the overall mix. They say that some information is already available, and that releasing specific details would only frighten and confuse the public, and would come at great expense to the industry's competitive business. "Halliburton's proprietary fluids are the result of years of extensive research, development testing," said Diana Gabriel, a company spokeswoman, in an e-mail response. "We have gone to great lengths to ensure that we are able to protect the fruits of the company's research…. We could lose our competitive advantage." "It is like Coke protecting its syrup formula for many of these service companies," said Scott Rotruck, vice president of corporate development at Chesapeake Energy, the nation’s largest gas driller, which has been asked by New York State regulators to disclose the chemicals it uses. Thanks in large part to hydraulic fracturing, natural gas drilling has vastly expanded across the United States. In 2007, there were 449,000 gas wells in 32 states, thirty percent more than in 2000. By 2012 the nation could be drilling 32,000 new wells a year, including some in the watershed that provides drinking water to New York City and Philadelphia, some five percent of the nation's population. The debate over water arises at a critical time. In his last days in office President George W. Bush has pushed through lease sales and permits for new drilling on thousands of acres of federal land. 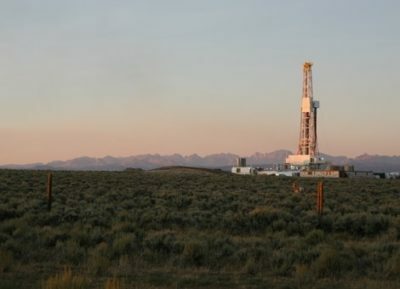 President-elect Barak Obama has identified the leasing rush as one of his first pressing matters and is already examining whether to try to reverse Bush's expansion of drilling in Utah. In September, the Bureau of Land Management approved plans for 4,400 new wells in Sublette County, despite the unresolved water issues. Tests there showed contamination in 88 of the 220 wells examined, and the plume stretched over 28 miles. When researchers returned to take more samples, they couldn’t even open the water wells; monitors showed they contained so much flammable gas that they were likely to explode. "We need the gas now more than ever," says Fred Sanchez, whose water well is among those with high levels of fluoride. But gazing off his deck at the prized trout waters of the New Fork River, he wonders whether drilling has gone too far. "You just can't helter skelter go drilling just because you have the right to do it. It's not morally right to do it. There should be some checks and balances." "There is no direct evidence that the gas drilling has impacted it," says Mark Thiesse, a groundwater supervisor for the Wyoming DEQ. "But it sure makes you wonder. It just seems pretty circumstantial that it’s happening." The EPA’s regional office in Denver sharply disagreed. But because it has only an advisory role in the federal review process, and hydraulic fracturing is exempted from the Safe Drinking Water Act, there was little the EPA could do. It rebuked the BLM in a strongly worded letter and gave the development plans in Sublette County a rare "unsatisfactory" rating. It also recommended that the project be stopped until further scientific study could be done. Drilling operators said the benzene came from leaky equipment on the trucks that haul water and waste to and from the drill sites -- and in one or two cases, EPA scientists say that was likely. 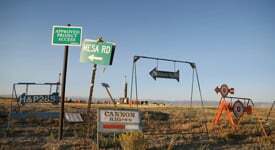 One theory put forth by the BLM blamed the benzene contamination on malicious environmentalists "hostile to gas production," an accusation the agency later said it had no evidence of. Thiesse, the DEQ supervisor, recounted a meeting where the debate dwindled down to semantics: "I called it contamination, and somebody said is it really contamination? What if it's naturally occurring?" The industry insisted, as it has for years, that hydraulic fracturing itself had never contaminated a well, pointing to an anecdotal survey done a decade ago by the Interstate Oil and Gas Compact Commission, a coalition of state regulatory bodies and, again, to the 2004 study by the EPA (PDF). "You have intervening rock in between the area that you are fracturing and the areas that provide water supplies. The notion that fractures are going to migrate up to those shallow formations -- there is just no evidence of that happening," says Ken Wonstolen, an attorney representing the Colorado Oil and Gas Association who has worked with the petroleum industry for two decades. "I think fracturing has been given a clean bill of health." A flurry of mail from industry representatives to the BLM said the sort of study the EPA wanted would needlessly slow production. 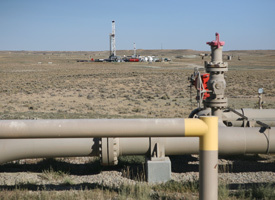 "BLM's restrictions on drilling in the Intermountain west have seriously reduced the supply of natural gas reaching consumers," wrote the American Gas Association. 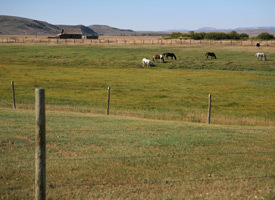 "The BLM looks at it more as a business-driven process," Otto said. "It's not like I have Vice President Cheney calling me up and saying you need to get this done. But there definitely is that unspoken pressure…mostly from the companies, to develop their resources as they'd like to see fit…to get things done and get them done pretty fast." The 2004 EPA study (PDF) is routinely used to dismiss complaints that hydraulic fracturing fluids might be responsible for the water problems in places like Pinedale. The study concluded that hydraulic fracturing posed "no threat" to underground drinking water because fracturing fluids aren't necessarily hazardous, can’t travel far underground, and that there is "no unequivocal evidence" of a health risk. Buried deep within the 424-page report are statements explaining that fluids migrated unpredictably -- through different rock layers, and to greater distances than previously thought -- in as many as half the cases studied in the United States. The EPA identified some of the chemicals as biocides and lubricants that “can cause kidney, liver, heart, blood, and brain damage through prolonged or repeated exposure." It found that as much as a third of injected fluids, benzene in particular, remains in the ground after drilling and is “likely to be transported by groundwater." "Our draft is pending release," a senior EPA official wrote to Halliburton’s counsel in an August 2003 e-mail. "It would certainly strengthen our preliminary position not to continue studying the issue…if the service companies were able to remove diesel all together, or even move in that direction." In a subsequent meeting, an EPA official’s handwritten notes show that a Halliburton attorney asked federal officials, "Are we willing to entertain regulatory relief in other areas; eg: fewer inspections?" "Willing…," was the reply from Tracy Mehan, then the EPA’s assistant administrator for water. The diesel agreement (PDF) was signed. But according to the EPA, it isn't legally enforceable and the agency hasn't checked to see if diesel is still being used. Furthermore, the agreement applies only to fluids used in a specific kind of gas drilling, not all drilling across the United States. Mehan did not return calls for comment about his negotiations. Roy Simon, associate chief of the Drinking Water Protection Division's Prevention Branch at EPA headquarters in Washington says the "EPA still stands by the findings outlined in the (2004) report." Suddenly the Amos' drinking water well exploded like a Yellowstone geyser, firing its lid into the air and spewing mud and gray fizzing water high into the sky. 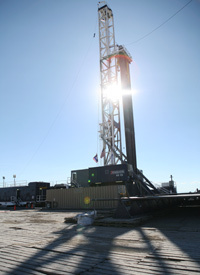 State inspectors tested the Amos well for methane and found lots of it. They did not find benzene or gasoline derivatives and they did not test fracking fluids, state records show, because they didn't know what to test for. The Amoses were told that methane occurs naturally and is harmless. Inspectors warned them to keep the windows open and vent the basement, but they were never advised to protect themselves or their infant daughter from the water. It wasn't until three years later, when Laura Amos was diagnosed with a rare adrenal tumor, that she started challenging the state about the mysterious chemicals that might have been in her well. Much of what is known about the makeup of drilling fluids comes from the personal investigations of Theo Colborn, an independent Colorado-based scientist who specializes in low-dose effects of chemicals on human health and has testified before Congress (PDF) on drilling issues. 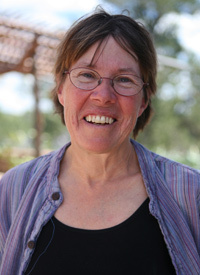 Although she opposes drilling, her research is referenced by scientists at the EPA, at the United States Geological Survey and at state-level regulatory agencies and is widely believed to be the most comprehensive information available. 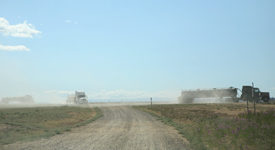 Spurred by reports of water contamination in Colorado, Colborn painstakingly gathered the names of chemicals from shipping manifests that trucks must carry when they haul hazardous materials for oil and gas servicing companies. Whenever an accident occurred -- a well spill in Colorado, or an explosion at a drilling site in Wyoming – she gathered the data that became available after water and soil samples were tested for contaminants, adding the results to her list. In Garfield County, there were signs this was already happening. Animals that had produced offspring like clockwork each spring stopped delivering healthy calves, according to Liz Chandler, a veterinarian in Rifle, Co. A bull went sterile, and a herd of beef cows stopped going into heat, as did pigs. In the most striking case, sheep bred on an organic dairy farm had a rash of inexplicable still births -- all in close proximity to drilling waste pits, where wastewater that includes fracturing fluids is misted into the air for evaporation. Among Colborn’s list of nearly 300 chemicals -- some known to be cancer-causing -- is a clear, odorless surfactant called 2-BE, used in foaming agents to lubricate the flow of fracking fluids down in the well. Colborn told Congress in 2007 that it can cause adrenal tumors. "Our daughter was only six months old when fracturing blew up our water well," Amos wrote in a letter to the Oil and Gas Accountability Project, an anti-drilling group. "I bathed her in that water every day. I also continued breast-feeding her for 18 more months...If there was a chemical in my body causing my tumor, she was exposed to it as well." In 2006, Amos stopped talking to the media after she accepted a reported multi-million settlement from Encana. The company was fined $266,000 for "failure to protect water-bearing formations and…to contain a release of (gas production) waste." Yet investigators also concluded, without further explanation, that hydraulic fracturing was not to blame. Asked about the Amos case and the rash of complaints in the area, an Encana spokesman said the company disagreed with the state's judgment on the Amos case and emphasized that there was no proof that fracturing had caused the explosion. Environmentalists had created a climate of fear in the community, he added. "The concerns residents have expressed -- and some of them are legitimate and heartfelt concerns -- a lot of them are out of misinformation," said Doug Hock. "Just because chemicals are used at a site does not create risk. We have a proven process that helps us ensure that there are no pathways." "We've kind of reached the tipping point," says Dhieux, the EPA inspector in Denver. "The impacts are there." In December 2007, a house in Bainbridge, Ohio exploded in a fiery ball. Investigators discovered that the neighborhood’s tap water contained so much methane that the house ignited. A study released this month concluded that pressure caused by hydraulic fracturing pushed the gas, which is found naturally thousands of feet below, through a system of cracks into the groundwater aquifer. In February a frozen 200-foot waterfall was discovered on the side of a massive cliff near Parachute, Colo. According to the state, 1.6 million gallons of fracturing fluids had leaked from a waste pit and been transported by groundwater, where it seeped out of the cliff. In a separate incident nearby in June, benzene was discovered in a place called Rock Spring. Three weeks later a rancher was hospitalized after he drank well water out of his own tap. Tests showed benzene in his water, and the Colorado Oil and Gas Conservation Commission cited four gas operators, not knowing which one was responsible for the spill. Colorado state records show more than 1,500 spills since 2003, in which time the rate of drilling increased 50 percent. In 2008 alone, records show more than 206 spills, 48 relating to water contamination. The most stringent reforms are being pursued in Colorado. Last year it began a top-to-bottom re-write of its regulations, including a proposal to require companies to disclose the exact makeup of their fracking fluids -- the toughest such rule in the nation. In mid-August, the Colorado debate intensified when news broke that Cathy Behr, an emergency room nurse in Durango, Colo., had almost died after treating a wildcatter who had been splashed in a fracking fluid spill at a BP natural gas rig. 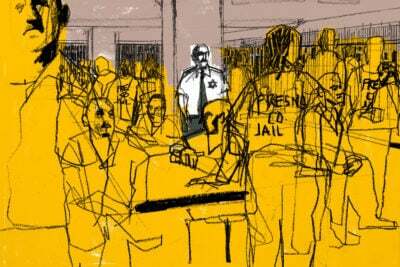 Behr stripped the man and stuffed his clothes into plastic bags while the hospital sounded alarms and locked down the ER. The worker was released. But a few days later Behr lay in critical condition facing multiple organ failure. "A disclosure to members of the public of detailed information…would result in an unconstitutional taking of [Halliburton’s] property," the company told Colorado’s Oil and Gas Conservation Commission. "A number of studies have concluded there are no confirmed incidents of contamination of drinking water aquifers due to stimulation operations…EPA reached precisely this conclusion after undertaking an extensive study." Then Halliburton fired a major salvo: If lawmakers forced the company to disclose its recipes, the letter stated, it "will have little choice but to pull its proprietary products out of Colorado." The company’s attorneys warned that if the three big fracking companies left, they would take some $29 billion in future gas-related tax and royalty revenue with them over the next decade. In August, the industry struck a compromise by agreeing to reveal the chemicals in fracturing fluids to health officials and regulators -- but the agreement applies only to chemicals stored in 50 gallon drums or larger. As a practical matter, drilling workers in Colorado and Wyoming said in interviews that the fluids are often kept in smaller quantities. That means at least some of the ingredients won’t be disclosed. "They’ll never get it," says Bruce Baizel, a Colorado attorney with the Oil and Gas Accountability Project, about the states’ quest for information. "Not unless they are willing to go through a lawsuit. When push comes to shove, Halliburton is there with its attorneys."